Do you dare explore the "The Lair of the Wraith Lord"? This is a 36"x36" terrain mat perfectly suited for Role-Playing games, fantasy skirmish gaming, Pulp gaming, and other games that might require you to enter an enchanted and dangerous dungeon! It works best with 15mm or 28mm scale figures. 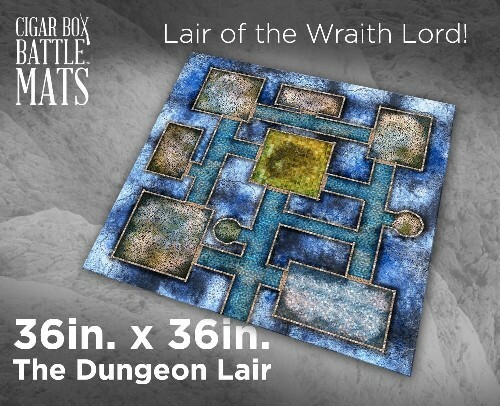 Use this mat "as is" or add your own dungeon terrain for a dynamic gaming experience. We use this mat for Old School RPG dungeon crawls, Hackmaster, Frostgrave, and Pulp Games (The Mummy / Call of Cthulhu). What would you use it for? Explore all the corridors and rooms of the dungeon and seek your treasure!